The Board button , provides access to a many of commonly used functions. Connect. Opens the log-on window for connecting to a Board Server. Open Capsule. Allows to open a Board capsule. Open Screen. 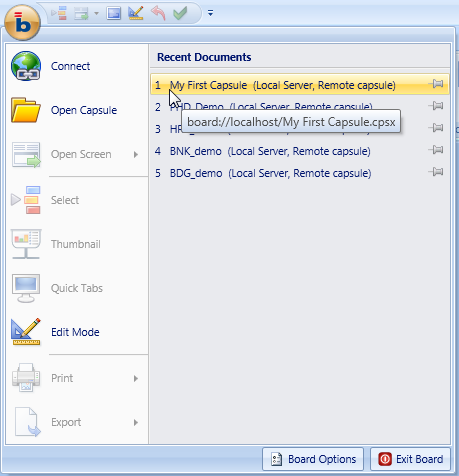 Shows the list of screen of the currently open capsule and allows to jump to a desired screen. Select. Opens the Select function, to apply a selection on entity members to the currently open screen. Thumbnails. When you have capsule screen containing multiple objects (tables, charts, etc..), this feature provides a miniature visual view (called a thumbnail) of all objects present on the screen and allows to easily find and maximise one of them. This function can also be run by pressing the function key F12. Quick Tabs. When you have multiple screens of a capsule open at once, each one is displayed on a separate tab. These tabs allow to easily switch between screens. Quick Tabs provides a thumbnail of all your open tabs. This makes it easier to visually find the desired screen: double click on a thumbnail to open the corresponding screen. Edit Mode. Allows to switch between Edit and Play mode - Refer to Workspace basic features for details about Edit and Play modes. Print. Prints the current capsule screen. There are two available options, Print the screen and Print a hard copy. Refer to Printing from the Board Client for details. Microsoft Excel Workbook as flattened table. Refer to Exporting from the Board Client for details. Recent Documents. Displays the list of the recently opened capsules. It’s possible to customize the Board Button icon.It’s sufficient to put a PNG file properly prepared and named icon.png in the same folder of the Board Client executable file. The default path is C:\Program Files\Board\Board Client. The Board logo will be visible again by deleting the file.